Rural climate services can provide benefits to both women and men by addressing gender-based challenges that prevent access to and action on weather and climate information. Working with women’s groups and identifying gender-based preferences for use of information and communication technologies (ICT) can be important pathways to enhance women’s access to communication channels. To address gender-based access constraints, it is important that interventions include partners experienced in promoting gender equality in decision-making spaces. It is critical to provide weather and climate information that is relevant to both women and men farmers’ needs. Collaboration with rural development initiatives that promote women’s empowerment can be key to supporting women farmers who may have limited capacity to act on information. Gumucio T, Hansen J, Huyer S, van Huysen T, Schwager S. 2018. 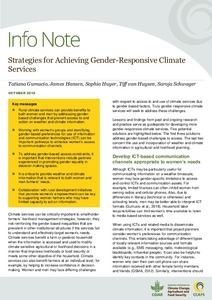 Strategies for achieving gender responsive climate services. CCAFS Info Note. Wageningen, Netherlands: CGIAR Research Program on Climate Change, Agriculture and Food Security.